Kyle Busch took the lead with 21 laps to go on a restart and held it the rest of the way to win Friday night’s NASCAR Nationwide Series Lipton Tea 250 at Richmond International Raceway. 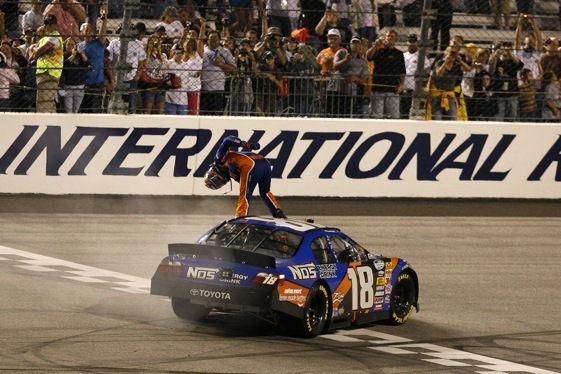 The victory allowed Busch to pad his points lead over Carl Edwards, who finished second at Richmond. Busch’s lead is now 82 points – far from secure but enough to put a smile on his face. Busch entered last year’s Chase in the Cup series with momentum and points, but then the digging ran into trouble. So he knows what can happen to point leads. Matt Kenseth was third and Brad Keselowski, who won last weekend’s Sprint Cup race at Talladega, was fourth. Busch’s victory was due in large part to execute on restarts, which were numerous in the late going Friday. His final pass for the lead came on a restart, as a matter of fact. It came against Edwards. Kevin Harvick was fifth and Joey Logano was sixth.